Candidates may be eligible to claim part of the cost incurred under the Investing in Skills Scheme. Click here for further information. Applications forms must be received by the Investing in Skills Unit at least 21 calendar days before start date of training. A discounted price is available for students. Booking is subject to availability and on presentation of a valid student card. For full programme and registration form please click the pdf file below. Understand the objective of risk management and the advantages of adopting enterprise-wide risk management as strategic asset in any organisation. Have expanded their knowledge of innovative risk management techniques and methodologies. Have learned basic theoretical and practical skills of risk management for immediate application. Be updated on the best industry practice on risk framework, governance and approaches. 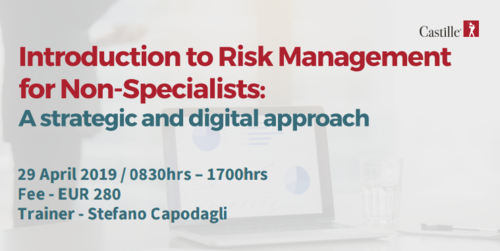 This workshop suits entrepreneurs, professionals, managers, practitioners, who wish to enhance their basic risk skills with a more comprehensive, innovative and industry best practice-based risk management knowledge and its practical applications. Think strategically about risk management and use the learned basic concepts. Be motivated to start using the learned techniques in their areas of work. STEFANO CAPODAGLI, MBA, CPA/IA, SIRM, MCSI is a change agent, certified coach and experienced trainer. Chief Risk Officer and former turnaround top manager with almost 25 years of people leadership and management experience at top tier financial services organizations and development financial institutions in EU (Italy, UK, Cyprus), Africa, Central and Eastern Europe and Middle-East. Stefano is passionate with a shining enthusiasm for learning and development. His expertise - a career in Risk, Banking/Trade Finance, Corporate Finance as well as Financial/Restructuring Advisory and Auditing, and past partnership ventures with Development Finance Institutions (AfDB, EBRD) and Microfinance groups, and a track record advising and guiding major transformation strategy and the shaping of policies for people and cultural development - places him in good stead for offering practical and realistic insights during his workshops for overhauling and fostering corporate risk culture. CTI Certified Professional and Team Coach (The Coaches Training Institute, London, UK, Co-Active Coaching Training Diploma), Executive MBA International Program (Bocconi University School of Management / Chinese University Hong Kong), BA/MA Honours in Finance and Banking (Rome La Sapienza University, Rome, Italy), Certified Public Accountant & Legal and Company Internal Auditor (Italian Association of Certified Chartered Accountants), Certified IRM Risk Specialist and Trainer (IRM, UK); Member of CSI (Chartered Institute of Securities and Investments, UK).